The land that is now the City of Fairview Park was first surveyed in the late 1700’s by General Moses Cleveland and his party of 49 others, agents for the Connecticut Land Company. They divided the land into ranges. The ranges were then numbered into townships. Township No. 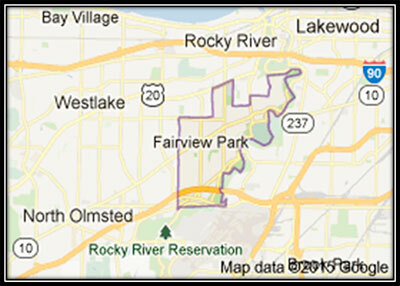 7, Range 14 included the recognizable names of Fairview Park, Rocky River, West Park, Parkview, and most of Lakewood. The township was purchased in 1807 for $26.87. In 1819, the 18 families who lived in Township No. 7 petitioned to have a name given to the place they lived. On February 24, 1819, their petition was granted and Rockport was born; appropriately named for the high, rocky embankments along the lakefront and along the sides of the Rocky River. Despite being densely wooded with patches of quicksand and inhabited by a variety of creatures including bears, wolves, rattlesnakes, and the less ferocious deer and turkey, Rockport continued to grow, attracting pioneer families looking for a better life. Some of the early settlers in the area include the Anthonys, Bassetts, Eatons, Jordans, Masticks, Millards, and Spencers. Rockport were considered “country” by the folks living in Cleveland. In the early 1900’s, truck-farming was a way of life. More often than not, produce grown and poultry raised in Rockport were taken to the West Side Market for sale. Hence, the name of truck farming – trucking your harvest to market. Individuality appeared to be a popular movement in 1910. A petition was once again sent to rename this area. Those living in the Fairview/Parkview area wanted to break away from Rockport and form their own community. On April 6, 1910, Goldwood Township was established. Within the year, 75 families petitioned to launch a new village. On September 10, 1910, Fairview Village received its official charter. The advent of Fairview Village divided Goldwood Township. The section along Center Ridge Road was absorbed into Rocky River. The southern section later incorporated as Parkview Village. On August 7, 1913, the Fairview Village Council authorized the purchase of a Town Hall site for the sum of $700. On October 2, 1913, the Village purchased $499 worth of lumber and hired laborers to erect a Town Hall. This structure was used until late 1967 when a Municipal Center was constructed on the current site of City Hall. In 1924, the Village purchased its first fire engine. This equipment was kept in a frame garage to the rear of the Town Hall until a fire station was constructed. In 1948, Fairview Village residents were urged by Mayor Bohlken to write the federal government for a post office. They found out that the village name needed to be changed because a Fairview, Ohio already existed. To comply with postal regulations, voters chose to rename Fairview Village as the Village of Fairview Park, so named for the fair view over the Metroparks. The first post office opened in November, 1949. The Village of Fairview Park officially became the City of Fairview Park on September 5, 1951. In the mid-1950s it became evident that home rule, which allowed for greater flexibility, was desirable and in November 1957, the voters elected a commission to frame a charter. The Charter of the City of Fairview Park was adopted effective January 1, 1959. The Charter called for a Mayor-Council form of government, which places responsibility for governmental policy with the City Council and administration on the Mayor. Area: 4.5 Square miles in Cuyahoga County. Transportation: Cleveland Regional Transit Authority (RTA), 25 min to Public Square, Cleveland; North Olmsted Bus Line, 45 min to Public Square, Cleveland. Nearby Access Routes: Rt. 20; I-480; I-71; SR 10 & 17. Education Information: Fairview Park Board of Education, 21620 Mastick Rd, Fairview Park, Oh 44126. (440) 331-5500. General Characteristics: A variety of homes ranging from smaller Cape Cods and colonials to luxurious homes located on spacious valley lots. Less than 5% of the homes are under 10 years of age. Few condominiums and an adequate supply of apartments. Recreation: 2 parks operated by the city; 1 public pool; tennis courts; 3 public golf courses; fishing; summer recreation program for children; soccer.